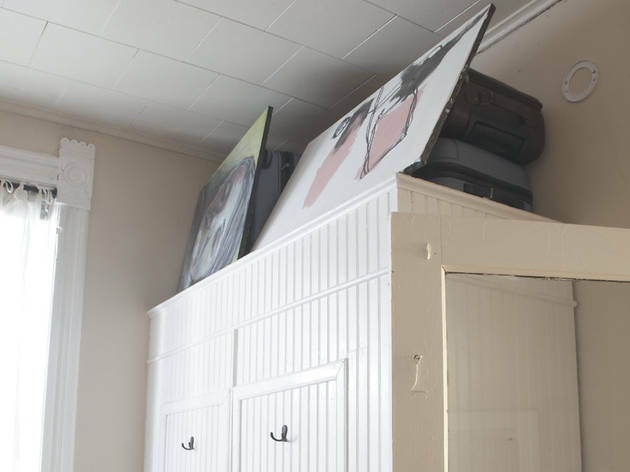 A small apartment forces this elementary-school art teacher to learn a lesson in minimalism. 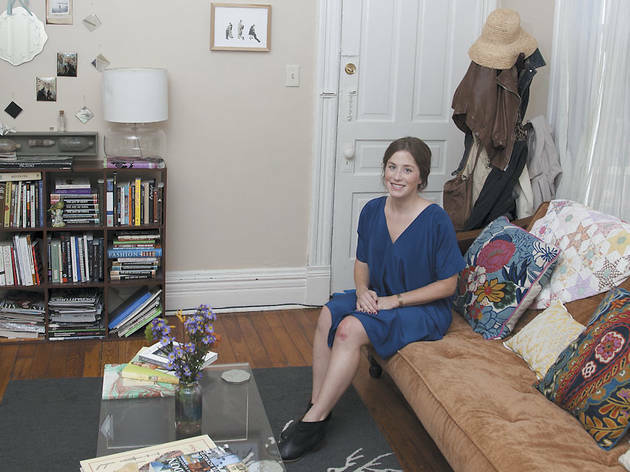 Photograph: Jeremy BolenMolly Naples moved into her 500-square-foot one-bedroom apartment in Wicker Park four years ago after living in a Lincoln Park high-rise, which "was a lot bigger and it had three walk-in closets," she says. 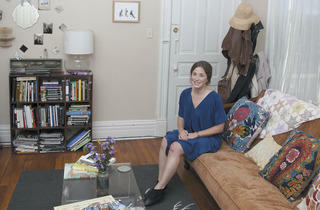 But Naples, 28, an elementary-school art teacher, couldn't afford the Lincoln Park rent. So she downsized and found she didn't miss the closet space. "I always held on to stuff I didn't need," she says. "I had tons of shoes. I ended up just getting rid of stuff at consignment stores. It helped me be a little bit more minimalist." She did miss being able to have an art studio in her apartment, but now, she says, "I just work in my classroom." Inspired by the work of artist Joseph Cornell, Naples has turned her small space into a collection of found objects, collages and paintings organized into vignettes. Despite the unit's small size, her friends love to hang out here. 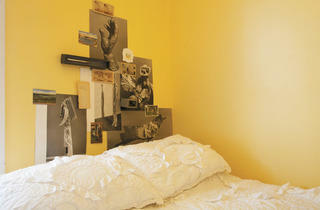 "My old apartment wasn't as cozy," she admits. Her friends have huge condos, but "they always end up at my place." 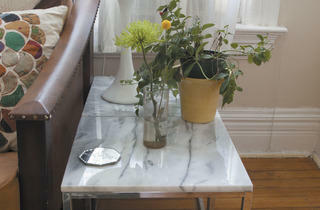 Naples already owned her CB2 Peekaboo acrylic coffee table when she moved in, but it worked perfectly in her new space. The transparent piece doesn't block sight lines or cramp the room, and still provides a view of the decorative area rug below while offering a surface for books and objects. Her futon takes up quite a bit of space, but it provides a comfortable seating place and plenty of room for out-of-town guests to crash. 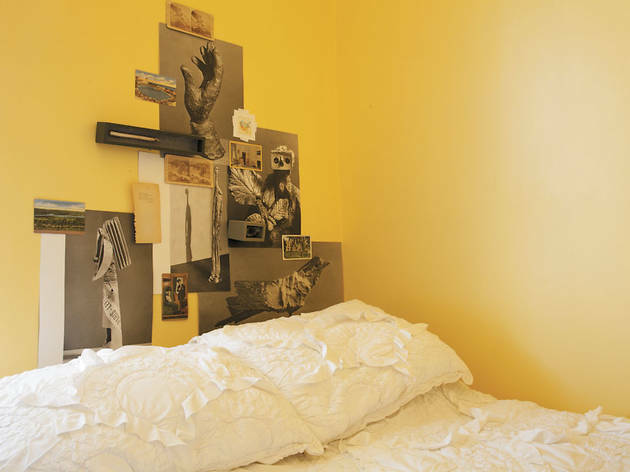 Photograph: Jeremy BolenHer bed couldn't fit in the tiny bedroom, so she ditched the old bed frame, and, inspired by art direction in Anthropologie catalogs, curated a collection of artwork on the wall behind her bed in a headboard shape. 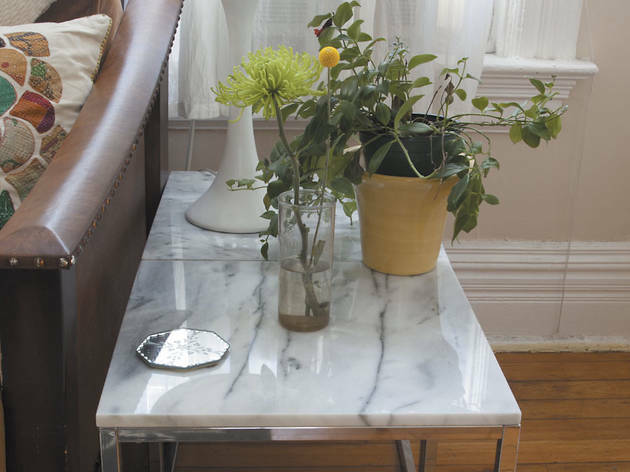 The result: a classy, finished look that doesn't take up any physical space. Photograph: Jeremy BolenA duo of petite end tables at Naples' apartment makes for efficient use of space, matching the depth of her couch without being too wide. 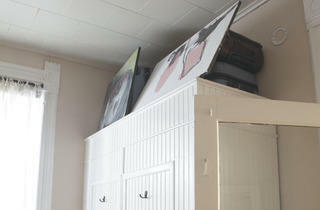 Photograph: Jeremy BolenNaples hides extra storage space with artwork.